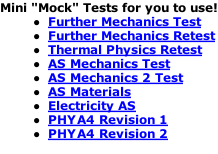 Home Page A-Level Past Papers Difficult Past Papers Optional Electronics Module About UmuTech? Below are some new content packs for you to revise and practice on. The mark schemes are at the end! Also - 2017 PHYA 1, 2, 4, and 5 have been uploaded. Best of luck for your exams in June!